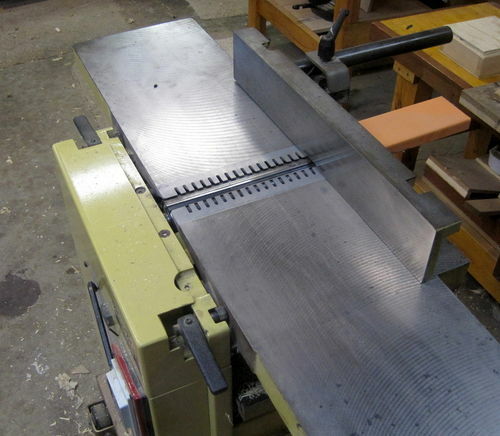 Or at least that was what I went looking for when I bought an FS-30 jointer-planer in early 2011. This review is after about eighteen months of use. Purchase: there was a chance to buy one at a good price in early 2011, so I went after it and placed an order in March. The machine arrived in good shape in late July. I didn’t expect that long of a delay, but wasn’t really bothered by that. The machine came very well packaged with lots of cardboard on a pallet. There was some damage to the packaging, but the only damage to the machine was a plastic cover that they replaced very quickly. Getting the machine off the pallet and onto a mobile base was a matter of using hoist straps and an engine crane. I didn’t have any issues there and setting up the machine was fairly quick and easy. The standard cleaning of the tables, etc. The FS-30 came with its standard Tersa head and I had already ordered some better blades in high speed steel and installing those is very easy and straightforward, though as I will detail below, there was a caveat. I have given much thought to getting a Shelix head for it, but for one I can find no clear instructions on how to install it and for two I have been very happy with the Tersa head. The machine isn’t particularly loud, even when cutting. Depends of course on what one is cutting. But much, much more quiet than a lunchbox planer overall. Use wise I am getting excellent results. The only tedium is how long it can take to raise and lower the planer table, but the results have been worth the hassle. My jointer technique needs work, but the planer is near perfect with barely any perceptible snipe. Blade wise at this point I am using the expensive carbide blades and do not regret the extra ~$300 I paid for them. They cut beautifully and seem to be quite durable so far. I have used the higher grade M42 HSS blades and they are nice, but I was able to wear them out too quickly. So given the cost and time, I am happy with this machine. I cannot say how it compares to others as this is my first jointer-planer. Ah yes, there are always issues. When I first used the machine, I thought I had set up the fence perfectly, but found that I wasn’t getting perfectly perpendicular cuts against the fence. The problem ended up being that the blades were not fully set across the width of the head. When installing blades, I recommend making sure there is no crud in those slots and running wood over the jointer at both ends of the blades to fully seat them. The manual does suggest running wood through the machine after installing the blades. Soon after getting the machine, I went to set up the fence in the above mentioned perfection but quickly saw that the fence was not flat. Correct me if I am wrong, but a jointer should really have a flat fence. So I brought this up with the salesperson who quickly went after getting that addressed. However, nothing happened. Careful examination of the fence showed that the issue is very uniform along the length of the fence. A curve to about 0.03” off near the top. This makes sense given the fence is an extrusion. I would guess the die is malformed. So I decided to take matters into my own hands and added a subfence to the fence out of MDF with the top inch or so relieved to cancel out the curve. I mounted the subfence using aluminum bars behind the fence face just as the fence is mounted. You can see this here in this cross section. This not only made the fence very flat, it also provides a sacrificial replaceable surface. Not that I really needed one, but it’s nice. Another solution came in the form of a spare part from Grizzly. They sell a j-p that is so close in design to the MiniMax that you can buy their fence as a spare part and with very little effort it bolts right onto the MiniMax bracket. This ironic and amusing solution costs under $100. To his credit, the salesperson I worked with did try many times but nothing happened. While this prevented my buying a bandsaw from them, I am otherwise quite happy with this Italian made machine. An update. Here, some years later, I decided to try buying a replacement fence from SCM (Minimax is part of that). I figured by now they have figured the issue out. Over $400 later, the fence arrives and is exactly as bad as the original. To make things even nicer, I called to ask to return the expensive part and was told that I cannot do that. Then I was told I need to provide photographs. I decided to not jump through any more hoops. Rather than stewing in regret, I replaced the Minimax part with a Grizzly copy, which cost $90, bolts right on the same place and is perfect flat. I have to say Grizzly’s customer service is much preferable for the few Grizzly machines I have. Their customer service for Minimax’s machines is even better than Minimax’s is. LOL. with the sub fence you lose some jointing width though, right? looks like a nice machine. too bad on the fence though, good fix, but the salesperson/company should really have stepped in and offered a replacement fence or another form of compensation. j – yes, you lose a bit under 3/4”. Hasn’t been an issue for me. I could probably have used thinner MDF, but that’s what I had on hand. The Grizzly fence is very flat though, so I can always mount that again if I happen to need that width. I have no grudge really. It is a very nicely made machine. Incredible how well set up it was from the factory. I have not adjusted anything. The tables are very close. There’s a tiny .002” dip in the center of the outfeed table near the cutters, but I don’t think anyone could ask for more perfect than they are. And the tables are stiff and thick. Given they live on a hinge, this is a good thing. No deflection to fuss over. This is a beautiful machine, but I am surprised that the fence is just aluminum extrusion and not solid cast iron. Earlier this year I gave some thought to getting something like this; the extra jointing width would be awesome, but I’d be sad to have the smaller planer width. 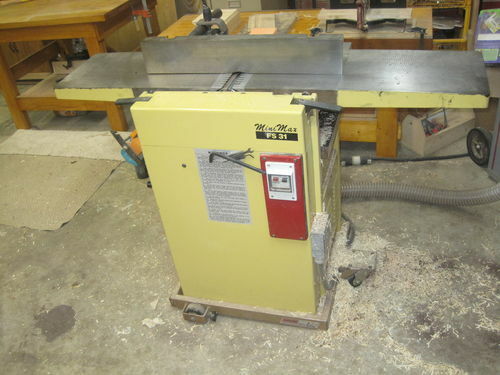 I also have a Mini-Max jointer/planer but I have the older Model FS-31. My machine has a solid cast iron fence. I wonder why they changed to aluminum on the newer models? Mine was purchased by my father in the early 90’s and its still running great today. In the last 20 years I have only had to have one repair done and it was only a small electrical part in the motor. You got yourself a good machine that will last a very long time. Here is a photo of mine showing the cast iron fence. Nice looking machine. If I could find a fence like that one I am sure I could adapt it to the FS-30. I should have a closer look at Grizzly’s other machines. Perhaps one has such a fence. I was just looking online at the FS-30 that you have and I noticed that the fence is much longer on your model. On the FS-30 the fence extends and even over hangs the in feed table. With mine as you can see in the photo it has a much shorter fence. Also the new fence is adjusted and moved differently on the FS-30. It looks like the fence adjustments are probably a lot easier on this model. And lastly the Aluminum fence is taller then my cast iron fence. This all makes me think that the reason they changed the fence from iron to aluminum was so that they could provide a taller and longer fence. If you had a cast iron fence that long and tall it would make it very heavy and hard to lift the table when changing it to planer mode. If you want a cast iron fence you could try and call Mini-Max and see if they have one. They may still have some of them in stock and its possible they could be used on your machine. Is Minimax still in business? I’ve been trying to look at their MM16 (bandsaw), and I’m routed to Laguna equipment. Their former owner, SCMI, sold them several years ago, but is now showing their equipment. I just recently had to call them with a question and I was able to reach them using the 800# on their site. Thanks. For some reason I have been unable to get that address to work – but did clinking on your link.